Rabbit Dash is your community cafe featuring a full menu of certified fair trade organic coffees, teas, hot chocolates and more. lots of goodies to munch on too! NEW!!!! We're doing lunches again! Each day we will feature a new soup and "dashie" (our take on a sandwich). All coffee can be bought in bulk, and we will even grind it for you to take home or to bring to the cottage. We are now serving ITALIAN SODAS! Rabbit Dash coffee house is dedicated to offering the best in quality. 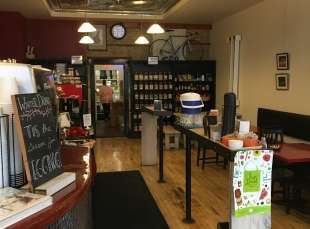 We have a large selection of certified fair trade organic coffees, the largest selection of tea in Port Elgin, Delicious treats, and a uniquely comfortable atmosphere. All coffee can be bought in bulk and we'll even grind it for you for any type of coffee maker. For our brewed coffee we offer a medium or dark roast that we change up quite often. We have all different varieties of tea. Black tea, green tea, herbal tea, Rooibos tea, just to make your decision difficult. All tea can bought by the cup, pot, or even in bulk. At Rabbit Dash coffee house, we try to promote the local visual arts, music, and more by offering our space as a gallery, acoustic venue, and all sorts of other community boosting things. So come on out and grab your drink of choice! It's always great to see your smiling faces! And keep your eyes peeled for more updates in the future and upcoming events! "We stumbled on this cafe on Goderich Street in Port Elgin and liked it so much, we returned several times! prices are right and tea/coffee and dessert selections great! Try the fruit galette - yum! Service is very friendly and atmosphere is very hospitable. Love the high tin ceilings and wood floors!"